Spinach Artichoke Quinoa Casserole Recipe is packed with vegetarian protein, chock full of vegetables and super easy to make. 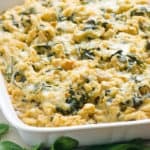 If you love spinach artichoke dip, you will love this creamy bake. Cook quinoa as per package instructions and set aside. Preheat oven to 375 degrees F and spray 9″ x 13″ baking dish with cooking spray. Preheat large non-stick skillet on medium heat and swirl oil to coat. Add onion and garlic, saute until translucent, stirring occasionally. In a small bowl, whisk milk with cornstarch and add to the skillet along with artichoke hearts, spinach, Parmesan cheese, 1/2 cup cheddar cheese, quinoa (fluff with a fork a bit before adding), 1/2 tsp salt and pepper. Stir until cheese is melted. Transfer mixture to prepared baking dish, level and sprinkle with remaining 1/4 cup cheese. Bake uncovered for 25 minutes. Serve hot. *If using frozen, thaw and drain. If using marinated, rinse and drain.